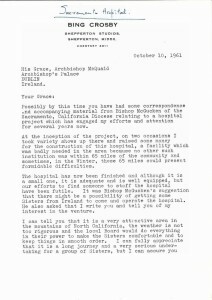 Letter from Bing Crosby to Archbishop John Charles McQuaid dated to 10 October 1961.
Letters from movie legend Bing Crosby to Archbishop John Charles McQuaid in October 1961 are among a host of archival treasures which will be displayed this Friday evening at Clonliffe College in Dublin as part of the city’s Culture Night. The Dublin Diocese has one of the largest archives in the country and for the first time it is participating in the cultural event. Rare and unusual documents have been selected by the Archdiocese’s archivist, Noelle Dowling, for the unique exhibition. 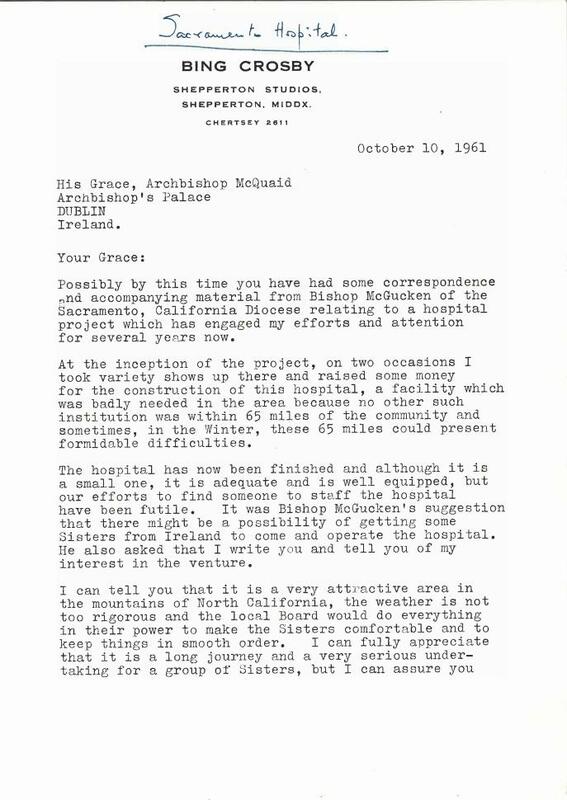 The letter from Bing Crosby to Archbishop John Charles McQuaid was written on 10 October 1961 seeking his assistance in locating Irish personnel to staff a hospital the actor was setting up in Sacramento in California. In the letter, the film star explains that he writes at Bishop McGucken’s suggestion because there might be some Sisters from Ireland who would come and operate the hospital. The Archbishop recommends the Irish Sisters of Mercy for the role. Elsewhere, the exhibition displays correspondence concerning the visit of Princess Grace of Monaco to Crumlin Hospital in June 1961. The oldest document in the exhibition, which takes place at Dublin’s former seminary, Holy Cross College Clonliffe between 6-9.30pm on Friday evening, is a parchment dating from 1558. Hugh Curwen, an English cleric who was then Archbishop of Dublin and Lord Chancellor of Ireland, and who had earlier expressed his approval of the marriage of Henry VIII to Ann Boylen in 1533, issued the Dublin parchment. It relates to his grant of land around Dunlavin to William Sarsfield. To mark the centenary of the 1913 Lockout, a large proportion of the exhibition includes documents chronicling the role of the Catholic Church in the dispute. The evening of culture will also include an exhibition of 20th century Irish religious art by artists such as Mainie Jellett, Patrick Pye, Evie Hone and Imogen Stuart, assembled from private collections, as well as a recital of sacred music. The Dublin Diocesan Music Group, soloists and special guest instrumentalists on harp and cello will perform music from Aichinger to Saint-Saens in addition to contemporary Irish composers.